We first heard about our son, Michael, when a friend of ours directed us to his profile on a Facebook page. We were in the process of trying to adopt through the foster care system at the time. Michael was 10.5 years old back then and had been adopted from China when he was 6 years old. His previous adoptive family had had him for 4.5 years at the time that they decided to dissolve his adoption. They had been working with Michael on some issues that he had from being adopted at an older age and from having been in an orphanage for his first 6 years. They had come to the point that they knew there wasn’t much left for them to do. 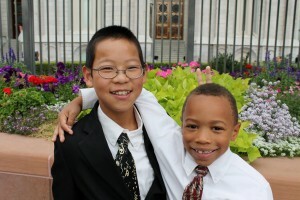 Michael was not progressing in their home, and he needed a new adoptive family. When we first read through Michael’s information, we were not sure he was the right fit for our family, but we went ahead and gathered more information from Second Chance. Cyndi was so helpful to us, always willing to answer our questions and listen to our thoughts and concerns. She set up a conference call with Michael’s first adoptive family and us and was there to support both of our families. We felt pretty good about the situation after the conference call, but decided to go to Michael’s state and actually meet him and his first adoptive family before making a commitment. That was a good thing for our family, as we were able to see that Michael was truly meant for our family and would fit right in. We proceeded with the paperwork, working with lawyers for both families (we were in different states) and were able to bring Michael into our home a couple of months after first learning about him. Michael fit into our family quite well. There were rocky times here and there throughout the initial adjustment, but overall it went well. Michael was not happy about having to be adopted into a new family and a lot of his initial anger stemmed from that, but he was also aware enough to realize that it was a necessary change. Eventually, Michael seemed happy to be with us and told us often that he was so thankful we had adopted him. We were able to legally adopt Michael 6 months after he joined our family. It was a great feeling for all of us and really helped him to further progress in our family. Michael just turned 14 years old. He has been with us for 3.5 years. It feels like he has always been here. He is a happy kid, with a great smile. He is doing well in school and is a joy to our family. We are so grateful that we heard about Second Chance and were able to adopt Michael. He has come a long way and it has been a great blessing to watch his progress, both physically and emotionally.